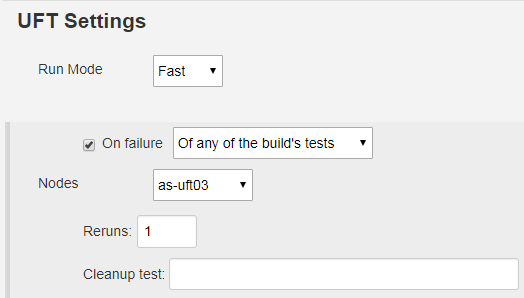 If you try to rerun failed tests using UFT-Specific Settings ( ), it doens't work if you launch the TestSuite from Octane or you describe test with wtbx syntax. The problem is about the test name to execute in Mtbx format. If you write the test path in Wtbx format (as Octane does) (see rerunLogWithMtbxTag.txt ) , the plugin fails with error "No valid failed tests to rerun were found. Fix the test paths.". If you report the absolute path of the test, it works (see rerunLogWithAbsolutePath.txt ).